BEIJING • Scientists have found evidence of a catastrophic flood that overwhelmed the upper Yellow River valley in China some 4,000 years ago, an event that they say may confirm the historical basis of China's semi-legendary first dynasty. Ancient Chinese texts record a mix of historical events and legends. Some records, such as those relating to China's second and third dynasties, were confirmed in surprising detail when archaeologists turned up inscriptions on oracle bones and ancient bronzes. But records of the first dynasty, that of the Xia, contain stories of a great flood with a Noah-like saviour, Emperor Yu, who gained the mandate of heaven after dredging canals to dispel the floodwaters and make the land safe. Historians have long wondered whether this flood account was a creation-style myth, the folk memory of a real event, or some mixture of the two. Some have dismissed the story of Emperor Yu as a fiction intended to justify centralised rule and, in the absence of any evidence of a massive flood at the time, many have regarded the stories of the Xia dynasty as more myth than history. A team of archaeologists and geologists, led by Mr Wu Qinglong of Nanjing Normal University, has now discovered evidence of a massive flood that they say could be the "Great Flood" mentioned in the Chinese annals. The flood along Asia's third-longest river would have been among the worst anywhere in the world in the last 10,000 years and matches tales of a "Great Flood" that marks the start of Chinese civilisation with the Xia dynasty. "No scientific evidence has been discovered before" for the legendary flood, lead author Wu told a news conference via telephone. Legend has it that a great flood along the Yellow River engulfed China 4,000 years ago. The flood forced the people to abandon farmlands for higher ground in the mountains, which were home to dense forests and wild beasts. The legendary Chinese ruler at that time, Emperor Yao, appointed his successor Shun to deal with the forest and Yu's father, Gun, to deal with the flood. Shun set the forest on fire, which not only reduced the vegetation, but also killed most of the animals, thus giving the human race more living space. Gun tried to contain the flood with man-made banks but failed. Yao then passed the throne to Shun because of his success, and Shun killed Gun before appointing Gun's son, Yu, to carry on with his father's unfinished job. Yu used a different method: He organised a dredging campaign, dug channels that would carry the water back to its source, and pioneered a tradition of great Chinese public works. He worked so hard he did not return home to see his family for more than a decade. Following his success in taming the floodwaters, Yu took the throne from Shun and established Xia, the first hereditary dynasty in Chinese history, where he passed power to his son, instead of his most meritorious subordinate. This set a precedent for later dynasties. According to the new study, the Xia dynasty would have been founded around 1,900BC, two to three centuries later than previous estimates. 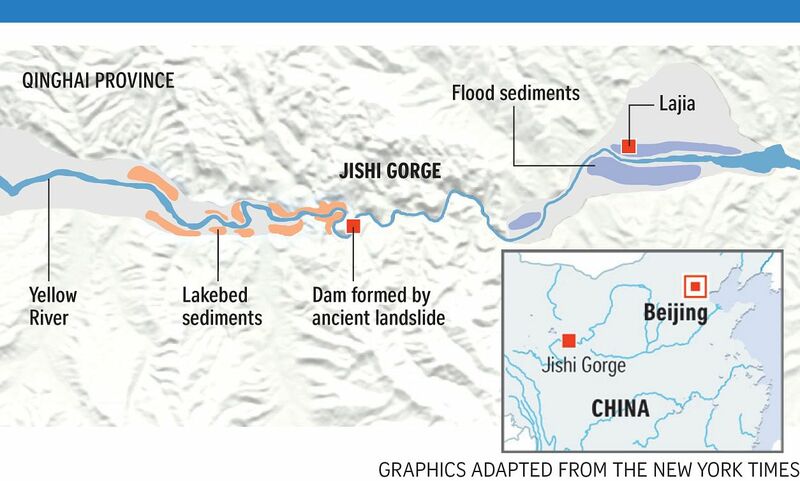 The setting for the flood was a landslide, caused by an earthquake, that planted a massive natural dam across the Yellow River where it travels through the Jishi Gorge after emerging from the Tibetan plateau. Judging from the remaining sidewalls, the researchers wrote in Friday's issue of Science, the dam would have risen some 244m above the river's present level. For six to nine months, Mr Wu's team estimates, the river ceased to flow as water accumulated in the new lake behind the dam. Then, as the water breached the dam's crest, it rapidly gave way, releasing up to 15.8 billion cubic metres of water, one of the largest known floods in the last 10,000 years. The flood wave could have travelled as far as 2,012km downstream, breaking the river's natural banks, causing extensive flooding and even making the Yellow River switch course. Floods are often hard to date. But the same earthquake that dammed the river provided a date by destroying a village called Lajia some 26km downstream. Fissures caused by the earthquake are completely filled with sediment from the flood, with no annual deposit of the windblown earth that is common in the region, which means the flood occurred in the same year as the earthquake, Mr Wu's team says. Radiocarbon dating of the bones of three children killed by the earthquake established that the event took place around 1,920BC. The date offers a striking temporal link to the Xia dynasty which, if it existed, is thought to have begun at this time. A modern Chinese chronology project sets the beginning of the dynasty at 2,070 BC. Even closer, two scholars working from Chinese astronomical records - a statement that there was a close conjunction of five planets early in the reign of Emperor Yu - have calculated that the dynasty began in 1,914 BC.